And so begins part two of my retrospective look at 2013. For those of you who may not have read part one, it covered the first half of my year, spent in Australia. For those of you who did, welcome back! Thanks for sticking with me. Now I will move on to the adventurous five months I have spent in the UK. The time I have spent abroad has been amazing thus far and I will share with you some of the highlights. Though there will be a strong focus on puppetry, I will also touch on other aspects of my time here; a few travel tales, some skating stories and perhaps a look at London life and other alliterations. I arrived in London August second and was met at the airport by my boyfriend Ted whom I had not seen in two months. Ted was living in London and I planned to spend two weeks with him before making the journey to the London School of Puppetry which is based in North Yorkshire. Flying just three weeks after my second surgery on my ankle, I was still quite limited in my movement and found keeping up with Ted challenging. This was however the first chance I had to get back on a bike and I found it a lot less trying than walking and so frequented London's Borris bike terminals during these weeks. The time spent in London with Ted was lovely; the summer weather, the freedom to explore and the quality time together all made for a fantastic reunion. While in London, I had my first taste of the London School of Puppetry's style of training, undertaking an intensive one day crash course in glove performance with Co-founder of the school, Ronnie Le Drew. I have written about this experience in more detail in an earlier blog post but I will say that this day was absolutely fantastic; I learnt so much and felt genuinely inspired and motivated to begin my studies. This first meeting with Ronnie was one I will not soon forget. An incredibly talented and experienced performer, not to mention charismatic, good humored and very approachable, I have had the opportunity to spend time with Ronnie throughout my time in the UK and feel very privileged. On August 16 I made the four hour journey to Grassington, a small village in North Yorkshire which was to be my new home for the next month and a half. I would be living at the London School of Puppetry itself, a beautiful multi-story house overlooking the river. On arrival I was absolutely astounded at how beautiful this village is. I was greeted by two people, both of whom I very quickly came to consider good friends, Melanie Smith and Kate James-Moore. Mel looks after the house, and really all of us within it... the calm a midst the chaos, Mel was always a soothing presence among students and tutors and also happens to make the best bangers and mash I have ever had! Kate is honestly one of the most interesting and talented people I have met. The head of the school Caroline Astell-Burt and the other students were in Edinburgh for the fringe festival at the time and Kate had been asked to be my tutor, one on one for three days. Having missed the first half of the glove module, it was Kate's task to help me catch up. We spent these days developing ideas for my solo performance piece and mapping out what the puppets would be. This was to be the first of many collaborations between Kate and I and I have enjoyed working with her immensely. When the time came for me to finally meet Caroline Astell-Burt, I was excited and nervous. This was a woman whom I had been communicating with for months, from my initial emails, to my phone interview and subsequent acceptance and all the emails that followed. Not to mention all of the stories I had heard through LSP graduates, I knew this meeting would be an important one. Caroline: How can i describe her? The moment she walked through the door, I knew this was a woman I would respect. Caroline is a beautiful woman, vibrant and colourful, with a smile that is somehow re-assuring and mischievous at the same time. A wealth of experience and knowledge in the field of puppetry, working with Caroline has been an absolute joy. I have so much respect for her teaching methods; while encouraging self motivation and problem solving, her guidance is second to none and the work expected of us at the school is both challenging and creatively fulfilling. Just two days in to the course, I posted the following on twitter: "Can't express how happy I am right now. LSP is absolutely the best place for me. Bliss. @puppet_school". Even now, this is exactly my sentiment every time I walk back in to that house. That isn't to say that it isn't incredibly hard work. I don't want you to get the wrong idea; there have certainly been times where I have struggled, been stressed out, worked late in to the night, even thrown a hissy fit or two... but it is all part of the journey, one I feel I have already grown so much from and look forward to continuing on in 2014. So much happened in that month and a half at LSP, it is hard to summarize (It is hard to believe it was only a month and a half!) If you are interested you can go back through my previous blog posts and read all about some of the fantastic experiences I had in this time, such as the experimental shadow film, our week with Emma Fisher, the real bread campaign, our workshop with Liz Walker and the Skipton Puppet Festival. In essence, and I apologize for gushing, the London School of puppetry is a magical place. I really mean that. For me who loves puppetry, the atmosphere within the school is one of the most special things I have ever encountered. Everyone at the school is passionate about their craft, however everyone comes from different backgrounds, has a different skill set and different goals within the field. The support within the group makes you feel incredibly validated. One of the nicest moments I witnessed was when Angie Macmillan, a fellow Melbournian and incredibly talented musician and puppeteer admitted that only through her time at LSP did she feel confident in describing herself as an "Artist". One of the fondest memories I have of LSP life is one of my first evenings in the house: After a hard days work and a delicious dinner, five students sat around the table and played... oven-mitt's became puppets improvising scenes, forks came to life while an accordion was played and people sang. This kind of play was common in the house and it was always so nice to be a part of. With all of these creative people living under the one roof, living and breathing puppetry, learning and growing together, the London School of Puppetry honestly is as I say, magical. One Blissful day in mid September, I had an appointment with a physiotherapist to check on my ankles progress. My physio in Australia had estimated that I would be safe to get back on skates around October and so I was absolutely thrilled when I was told that not only was I well enough to put my skates on, but in fact she encouraged it, saying it would be a great way to build up strength and balance. I raced back to the LSP house with the good news and was very excited to get my skates on as quickly as possible. I had lugged my gear all the way from Aus and dragged it around with me since arriving in the UK, here was my reward! I took to the driveway! The LSP driveway is about 100 meters long and relatively smooth; not ideal for skating, but absolutely perfect for me in that moment; I was in heaven. After five months, I was back on eight wheels and overjoyed to be. 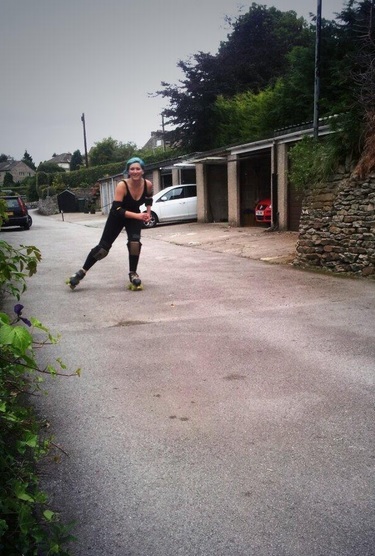 Not long after this I attended an open skate with the Leeds Roller Girls, my first chance to really give it my all. I felt confident on their large smooth rink and was welcomed warmly by the other skaters. Within the open skate they offered the chance to test your endurance. I was skeptical but decided to give it a shot to see how my speed had deteriorated since my injury in April. I had been running every day since arriving in Grassington and was pleased to see my work had payed off; I achieved 30 laps in 5 minutes, the exact same score as I had been getting prior to my injury, I was pleased as punch! Since relocating to London, I have been training with the London Rockin Rollers, an excellent league who have been incredibly kind and supportive. My first scrimmage with them was incredibly re-assuring, my skills were all still there if a little rusty. I am very excited to move forward with this league in 2014. I have been lucky enough to do some travelling while I have been here, which I will only go into briefly (or this post will never end!) The day after I finished at LSP, I headed to Germany with friends to attend Oktoberfest in Munich. This was an amazing experience; obviously a big drinking week, but also a nice chance to see more of Munich and catch up with some old friends. I also attended a training session with the Munich Rolling Rebels on my birthday! We visited Prague, an absolutely stunning city with a great culture and lots of puppets! Attending a show at the Prague Marionette Theatre "Don Giovanni", an adaptation of Mozart's Opera done with marionettes was a real highlight. It was a fantastic show, very funny and also very interesting as the marionettes they use have completely different controls to those that I have been learning with. I was eager to find out the pros and cons of both styles. We then journeyed to Berlin where we spent some time before I flew back to the UK. From there I traveled to Bangor in Wales where I worked on a project with writer Angela Roberts (see blog post "Rhita, the Welsh Giant"). Later in the year I spent a week in Amsterdam which was a lot of fun; my highlight was definitely our trip to the Science Center, an interactive playground for kids of all sizes! In November I returned to LSP for one week to work on a collaborative project with play write and poet Avaes Mohammad on his work in development "Of Another World" This project was really special, mainly due to the team of people we had collaborating together (see earlier post for all the gushy details). I worked on this project primarily as a performer and with the main style of puppetry being marionettes, I had the opportunity to really develop my skills through a lot of practice and rehearsal. I faced some interesting challenges in this week within the performance of the piece and learned a lot through my own reactions (both good ad bad). I gained a lot through this experience; not only my own development as a performer, but skills in collaboration and also the ability to adapt, or at least the willingness to. I also met some amazing people and had the chance to work with people I respect and admire. I have been blessed in my time here to have visits from both my Mum and my big sister, something that makes being so far from home that much more bearable. Though I have traveled many times before, I do get homesick from time to time and having these visits to look forward to was such a comfort. I had the chance to show my sister and her fiance my home in Grassington and share with them some of my work, something that meant a lot to me. We also spent a few days in London, doing some exploring together which was great fun. I was able to be with my Mum for her 50th birthday and Christmas which was an absolute highlight. We spent Christmas in the Scottish Highlands, staying in a cabin by Loch Lomond with friends and family; an absolutely stunning location with fantastic company, this was a very special time. Relocating to London, I was eager to get involved with a much puppetry as I could, signing up as a volunteer at the Little Angel Theatre and taking advantage of any opportunity that arose. Workshops, seminars, symposiums, shows; London has so much to offer in the way of puppetry and I am determined to get as much as I can out of my short time here (see SUSPENSE blog post for more details). Already I have learned so much from being in this amazing city. I have met some absolutely amazing people, seen some incredible work and taken part in some very eye opening workshops and seminars. 2013... It really is hard to believe, looking back, just how eventful the past year has been. Every year is instrumental in who I am and who I will be however some have more impact than others. 2013 feels to me like one of the more influential years. I have grown so much through the events that transpired and feel very proud of all I have accomplished, the challenges faced and the lessons learned. December thirty first found Ted and I in our new home in Camden, talking about our goals for the coming year, eating home made pizzas and toasting the future with White Russians in hand. Here's to 2014 folks, bring it on! !